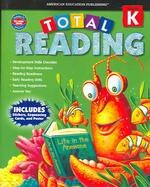 Kinder　total reading,Step by step instructions plus reading rediness1Develop early learning skills! Includes stickers ,sequencing cards and Alphabet poster! !